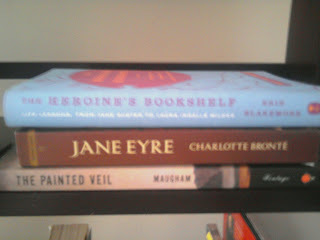 So, last week I stopped at Borders to purchase that Penguin cloth bound edition of Jane Eyre with my coupon and discount. However, once I got in there I just couldn't decide what to do. Should I get the deluxe edition or go for the cheaper copy because then I could get both Jane Eyre and The Painted Veil for the same price as the deluxe Jane Eyre. My husband finally got tired of watching me stand there with the choices in my hand and I hurriedly opted to get more for my $. Probably I will regret this in the long run, but for now my internal bargain hunter won out. I also picked up a copy of The Heroine's Bookshelf by Erin Blakemore which contains "life lessons" from some of literature's famous heroines such as Elizabeth Bennet, Scarlett O'Hara, Scout Finch, Laura Ingalls, Jane Eyre, and Jo March. It is a small little book, but I just couldn't resist. Hopefully it is as interesting as it looks! In blog related news, I am thinking about adding some new titles to the reading project list. I have also added a section to the blog called Post-It Notes where I can add links to various posts on other blogs that contain things that I just want to note for my reading journal. I also added a boring Disclaimer page to the blog just because many people advise that this is the smart thing to do. In reading related news, I am currently on page 762 in War and Peace. Only about 450 more pages to go! I really want to read The Heroine's Bookshelf. I heard about it on a podcast last week and it sounded like something I would fall in love with.